Owing to his great talent for melody and the delightfully fresh Czech character of his music, Antonín Dvorák achieved worldwide recognition. His technical abilities and rich melodic inspiration enabled him to create an oeuvre that includes masterpieces in many, if not all musical genres. In total, Dvorák wrote nine symphonies, the last five of which are his mature symphonies. Included in this SACD album are Dvorák’s symphonies nos 7 and 8, each of which, though different in character, represent Dvorák at his best. Symphony no.7 exudes rebelliousness. The treatment Dvorák’s homeland had received at the hands of the Austro-Hungarian Empire which ruled it, rankled the composer. The sunshine of Symphony no.8, written in his farmhouse in the Czech countryside, clears the air after the storms of Symphony No. 7. Dvorák’s rural surroundings may have influenced the music’s freshness and cheer. Music Director Andrés Orozco-Estrada masterfully interprets Dvorák’s Symphony no.7, a work that explores a range of emotions from grandeur and tragedy to pastoral reflection. 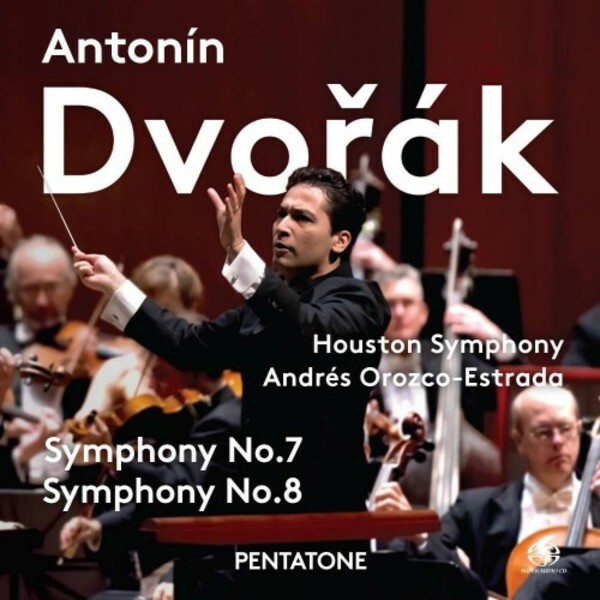 This is the debut album of a mini-series that features the last four great symphonies of Dvorák performed by the Houston Symphony under the baton of Andrés Orozco-Estrada, recorded with PENTATONE. This recording took place at the Jesse H Jones Hall for the Performing Arts in Houston, in April 2014 (Symphony no.7) and March 2015 (Symphony no.8).